Sheena and I had such a blast photographing Cynthia and Zach's wedding a couple of weekends ago at the historic Boulevard Club situated right on beautiful Lake Ontario in downtown Toronto. We loved everything about Cynthia and Zach's big day! From all the details the both of them put into their wedding from, to the warmth and love of all their friends and family and the emotions that we captured throughout the day, we truly felt a part of something special. We met up with Zach and his groomsmen early in the day and spent a short time with them capturing the guys joking around and hanging around the funky neighbourhood. We then made our way to Cynthia and Zach's house to capture the ladies getting make-up and hair done. This is when we try to find a creative way to capture the bride's dress and rings and Sheena and I both immediately agreed that we loved the front of their house and that the front door would make a unique natural frame for her stunning dress. 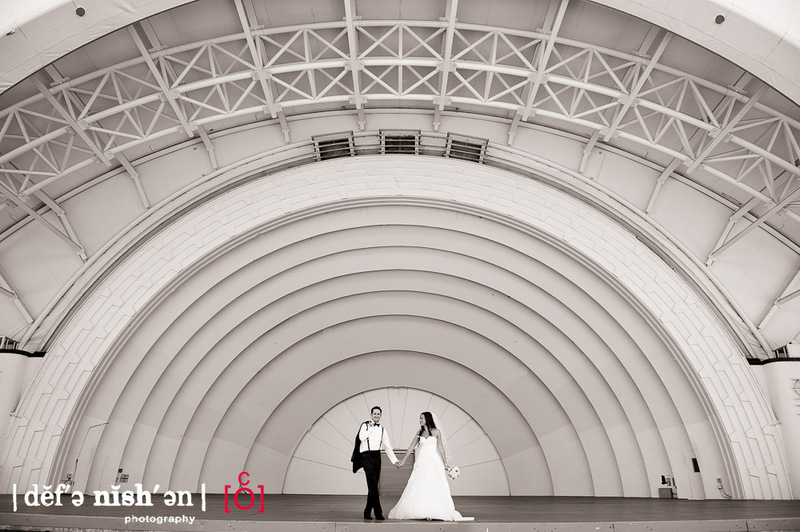 After many laughs and intimate moments, we headed to the CNE grounds to take some cool pictures of Cynthia and Zach on their own and with their wedding party. There are so many awesome artistic elements here that we were overloaded with ideas and a limited time. We kept a brisk pace and ended up with tons a great pictures before heading to the church for the main event. I was really excited for this part of the day because, being a dog lover myself, I knew that Cynthia's dog, Mickey, was playing an important role as he was going to be walking down the aisle! After a bit of trepidation, Mickey made it down the aisle for the ceremony to begin. Then, as quickly as it started, Cynthia and Zach were walking back down the aisle, but this time as husband and wife. This led directly to the reception back at the Boulevard Club. Throw in some brilliant sun, a panoramic vista overlooking the lake, great music and impromptu flash mob dancing, and you have a wonderful and memorable day that Cynthia and Zach will remember for the rest of their lives. We are so happy to have been a part of their day and wish Cynthia and Zach and wish the newlyweds all the best as they begin their new lives together!